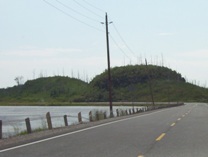 Highway 11′s frontier, from Beardmore through to the northern reaches of Temiskaming, with detours to White River and Hornepayne. 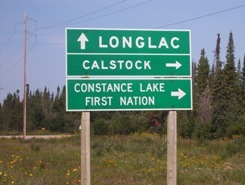 Constance Lake is about six kilometres north of Highway 11. 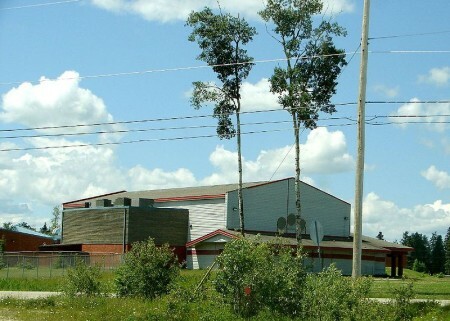 Constance Lake First Nation is a fairly nice community of about 700 people. I’ve visited a few times but never thought to take photos before this trip, however I was anxious to make it past Hearst before lunch and therefore didn’t stop in on this journey. 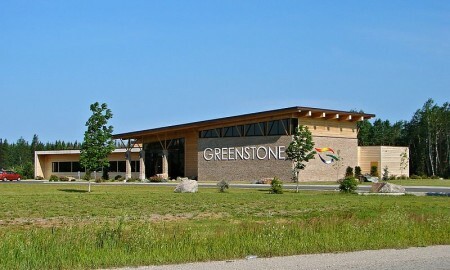 There are advertisements for an Ojibway-Cree Heritage Centre on Highway 11 just west of Constance Lake. However I think it is still under construction, even though it planned to open in June 2006. This will likely be a worthwhile attraction for anyone driving between Hearst and Longlac. 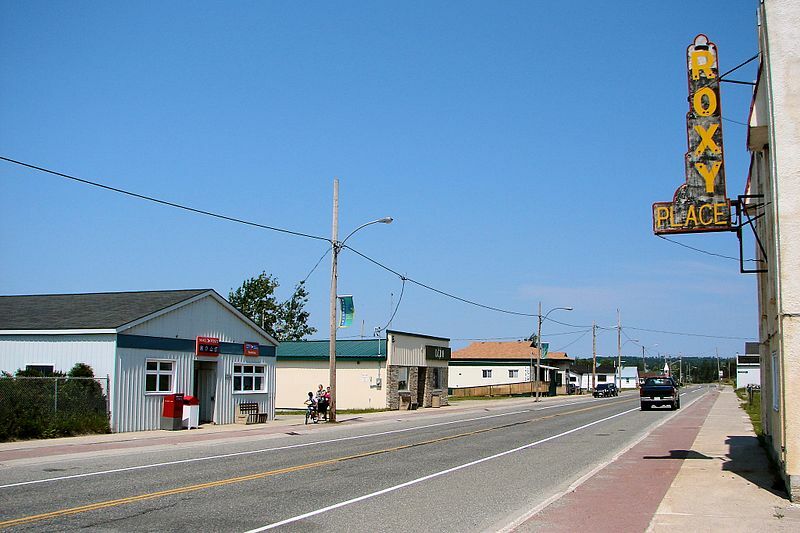 You can get gas in town at Norm’s Gas Bar, and for food there’s Kendra’s Diner on the outskirts of Constance Lake. Other services include the Sutherland General Store, an outfitters, and a shop called Crafts and Things. There’s also a post office and the Lecours Lumber operation. 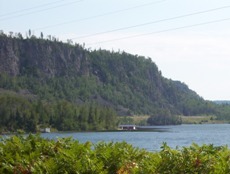 Constance Lake is also home to a power project that uses discarded wood fibre to make energy. 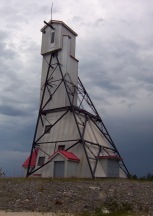 It is visible from Highway 11, about 10 kilometres before you turn off to Constance Lake. 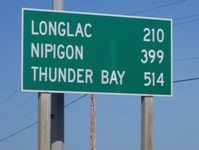 The 200 kilometres between Constance Lake and Longlac is one of the most annoying drives I have faced. Not because the roads are bad, or the scenery stinks, or it’s a hard drive – not at all. It’s not even really that long or that boring. But there are two problems. One – there is almost nothing there. And I really mean almost nothing. 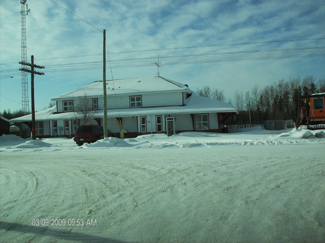 I counted five houses between Hearst and Longlac. Three of those were associated with wilderness businesses. There were a few derelict truck stops and out-of-business motels which serve as reminders of past attempts at economic development and the larger retreat of business from northern Ontario. There was a moose crossing roadsign that someone had defaced by adding an exuberant silhouette of moose genitalia (but there was a truck racing behind me so I couldn’t stop for a photo.) There is literally nothing for 200 maybe 250 kilometres, and that’s weird when you’re from southern Ontario. Get gas in either Hearst or Longlac, as may be only one stop on the way, if at all. Two — the drive is a pain because signs keep reminding you every 20 kilometres that, in what seemed like at least an hour, you’ve actually only travelled 20 kilometres. I don’t need to know that often that the drive is long, I know it already! How about updating me every 50 kilometres, that’ll feel like progress. There is however one nice rest station with running water, picnic tables, and washrooms (but no shops or gas.) It’s at Klotz Lake where, if you really want a break, you can even go swimming. I am super awesome at photography, non? Situated at the choppy headwaters of Long Lake, Long Lake First Nation is just across the bridge from Longlac. The first thing you notice is the old church. Sitting majestically on a peninsula that juts into the water, the church looks like the subject of horror movies and scary stories. You can see that the roof is falling in. Some windows are missing and the church needs repair. It’s old but has lots of character, and looks great sitting against the water. It looks perfect for movies or random exploring, however access from Highway 11 is blocked by a large no trespassing sign. The town is surrounded by some marsh land to the east. 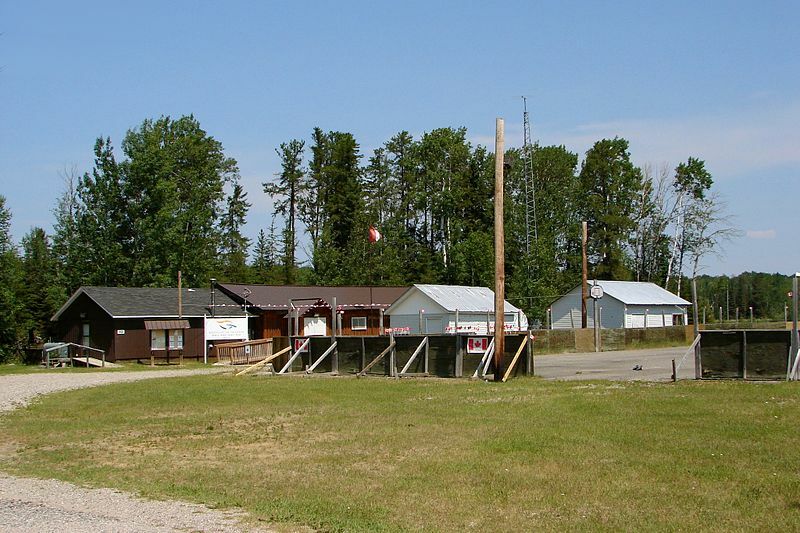 The Long Lake First Nation General Store offered gas and snacks. I didn’t go into town, however it seemed that there were about 50 homes and other buildings. 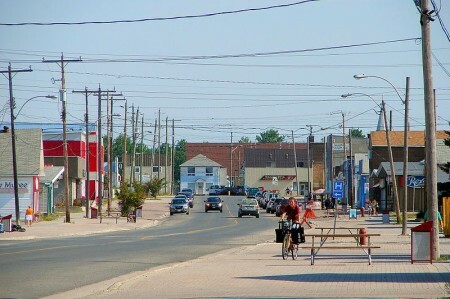 Compared to the many other spots on Highway 11’s mid-west corridor, Geraldton is a relatively bustling town of 2400, apparently with its own suburbs – Jonesville and Geraldton East. Geraldton has two town mottos – ‘Spirit of the North’ and ‘The Friendly Town with a Heart of Gold’. 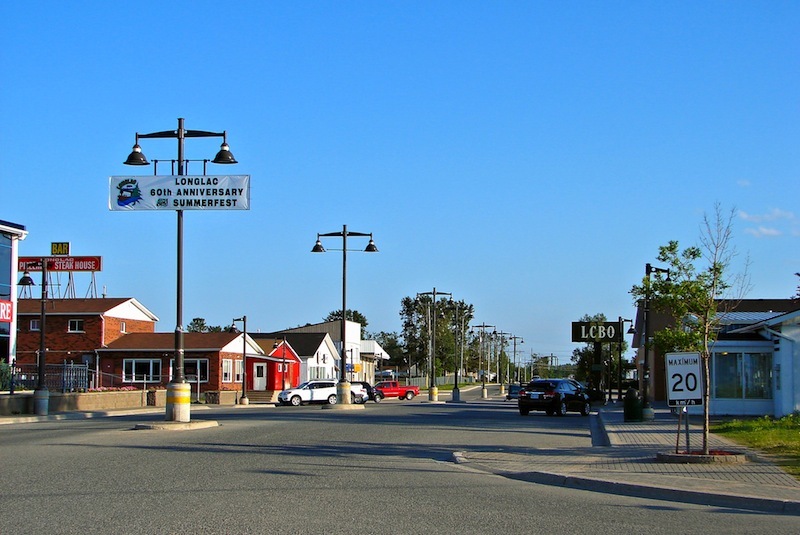 It’s obvious that the town has put its golden heart to good use, as it is one of the most actively and professionally marketed towns in northern Ontario. 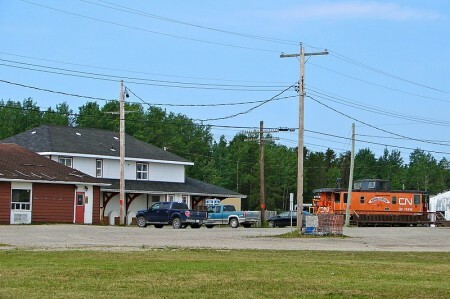 Thirty-eight kilometres west of Longlac, Geraldton has actively used a restored mine headspace in all its tourism literature. The mine shaft is quire nicely restored. 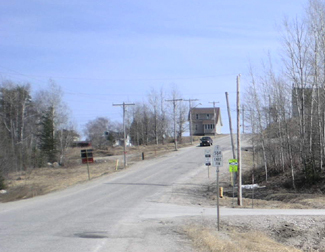 If you turn down Hardrock Drive (yes, it’s the best-named street in northern Ontario after Iroquois Falls’ Oil Tank Road) you’ll see a rocky landscape which I believe is the headframe’s parking lot and the starting point for the two hiking trails seen below. The Geraldton Discovery Centre, on Highway 11 across from the mine shaft, is also really nicely done-up. The Discovery Centre has exhibits on the area’s forestry and mining history, current practices in both industries, and also allows you to dress up in fireman gear and have your photo taken (handy if your wife or girlfriend is into that kind of thing and you’re not a firefighter like the most of us.) Geraldon is on the shores of Kenogamisis Lake, which, by the way, offers some low-level cliff diving opportunities (I don’t endorse/condone/promote/suggest doing this, I just observed some people doing while I drove past. Do not jump off cliffs into the water, it’s really dangerous.) Geraldton also has a nice golf course and some hiking trails. I happened to be in town for their annual August long-weekend Jamboree. I was planning to stop after I saw a Bristol board sign indicating that it was in nearby Macleod Provincial Park. With my drive time approaching the six hour mark, and the valuable contents of my wallet becoming increasingly sparse with each stop for gas and coffee and doughnuts, and the rain beginning to pour, I declined my chance to jam with the locals. I missed the town itself. 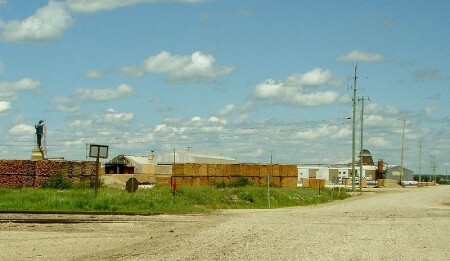 Geraldton is about five kilometres north of Highway 11. (I was tired. I was trying to make it to Nipigon without getting gas. (Danger Will Robinson. Red alert. BAD IDEA!) Plus. it was raining. I had just passed a hitchhiker and felt really really guilty but not guilty enough to take my life into my own hands in the middle of nowhere in order to save the guy from the downpour.) 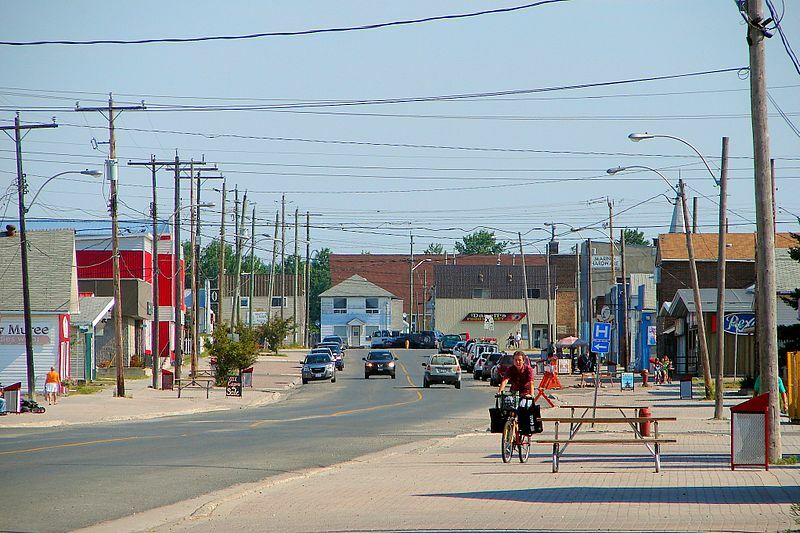 Therefore I continued along Highway 11, and missed out on mainstreet Geraldton. 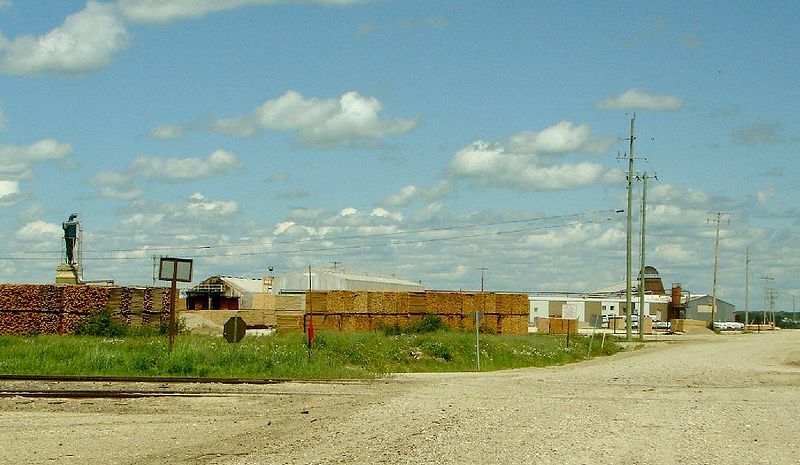 If you continue up the road past Geraldton, you’ll eventually hit Nakina and Aroland, two of Ontario’s more isolated northern towns. My map indicated that there were three communities on Highway 11 between Geraldton and Nipigon – Rocky Bay, Macdiarmid, and Orient Bay. This may or may not be true. The only thing I saw named Macdiarmid was a dirt road. I couldn’t find Orient Bay either, although truth be told I was getting weary of driving on this particular trip and didn’t really give it a good look. It might be the name of a lodge or an outfitters station, but I didn’t see it. But what is great about this part of Highway 11 is the drive itself. The scenery is absolutely fantastic. Stunning cliffs are the result of geological processes that have left the Pijitawabik Palisades as some of the most awe-inspiring views on Highway 11 . The highway is bordered by countless lakes which are nestled between beautiful rocky outcroppings that jut from the landscape like bumps on a log. 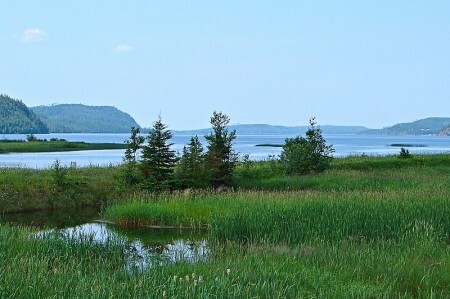 This drive is sincerely one of northern Ontario’s most scenic drives. So if you’re already out this way, don’t rush through – it is worth stopping and enjoying. A town of about 250 people, Lake Helen is home to the Red Rock First Nation, which hosts its annual traditional gathering from July 14 through to the 16th. Lake Helen has a nice beach and some beautiful views out onto the local lake, which is part of Lake Nipigon Provincial Park. 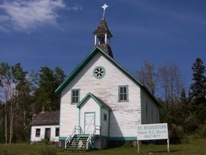 The town is also home to St. Sylvesters Roman Catholic Church. Built in 1877, the Jesuit mission is clearly historic and is marked by an on-site plaque, and some traditional scared ground on the other side of Highway 11.